The Gulf Coast Big Band has been performing since 1991. 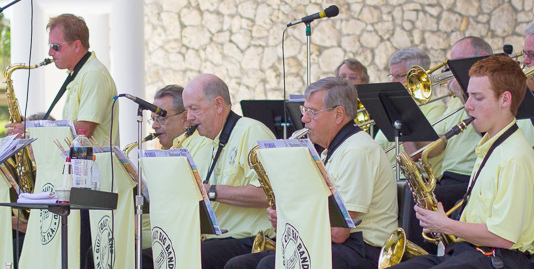 It plays big band and jazz standards to the delight of thousands at Sunday afternoon concerts-in-the-park at Cambier Park, Naples, Florida.The Band plays a wide range of big band music from traditional swing and blues to bebop and Afro-Cuban. Audiences enjoy songs from a large variety of jazz greats including Glenn Miller, Artie Shaw, Woody Herman, Duke Ellington, Count Basie, Dizzy Gillespie, Tadd Dameron, Stan Kenton, Sonny Rollins, and Thelonious Monk. The Gulf Coast Big Band is composed of a wonderful mix of musicians. Several are active or retired professional musicians as well as music educators. There are also musicians who are still working in or retired from other walks of life such as lawyers, stock brokers, and law enforcement officers. All of the musicians play without compensation for the love of music and in order to raise scholarship funds for local high school students.